Make sure that all passengers have their hands, etc. inside the vehicle while it is in motion and before closing the windows. Use the window lock switch to prevent unexpected use of the power windows. To help avoid risk of injury or death through unintended operation of the vehicle and or its systems, including entrapment in windows or inadvertent door lock activation, do not leave children, people who require the assistance of others or pets unattended in your vehicle. Additionally, the temperature inside a closed vehicle on a warm day can quickly become high enough to cause a significant risk of injury or death to people and pets. 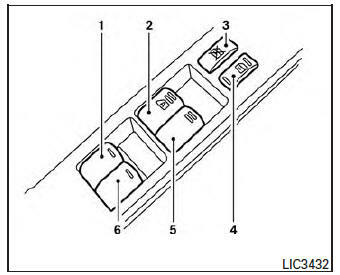 The power windows operate when the ignition switch is placed in the ON position, or for a period of time after the ignition switch is placed in the OFF position. If the driver’s or passenger’s door is opened during this period of time, the power to the windows is canceled. The driver’s side control panel is equipped with switches to open or close the front and rear passenger windows. To open a window, push the switch and hold it down. To close a window, pull the switch and hold it up. To stop the opening or closing function at any time, simply release the switch. 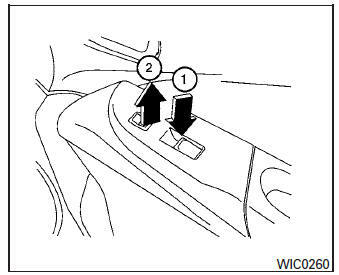 The passenger’s window switch operates only the corresponding passenger’s window. To open the window, push the switch and hold it down 1 . To close the window, pull the switch up 2 . The rear power window switches open or close only the corresponding windows. To open the window, push the switch and hold it down 1 . To close the window, pull the switch up 2 . 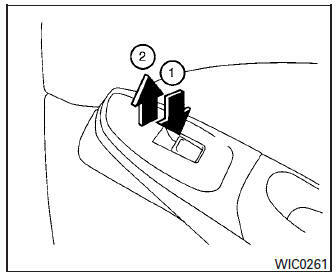 When the window lock switch is depressed, only the driver’s side window can be opened or closed. Push it again to cancel the window lock function. To fully open a window equipped with automatic operation, push the window switch down to the second detent and release it; it need not be held. The window automatically opens all the way. To stop the window, lift the switch up while the window is opening.